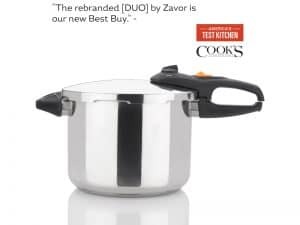 Zavor is excited to introduce their premiere multi-cooker, the LUX Edge. 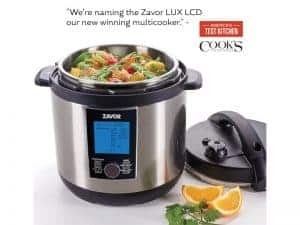 The LUX Edge Multi-Cooker functions as a pressure cooker, slow cooker, traditional rice cooker and a yogurt maker all in one with a full menu of various food specific functions for easier programming. The three cooking assist functions – Brown, Sauté and Steam – offer added utility to this multifaceted unit. 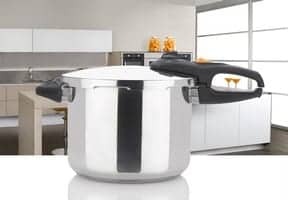 The Manual function allows for absolute cooking flexibility, allowing customers to use the unit as a pressure cooker, slow cooker or a traditional stockpot. Including Keep Warm and Time Delay functions, the LUX Edge is the perfect culinary solution for the modern kitchen. 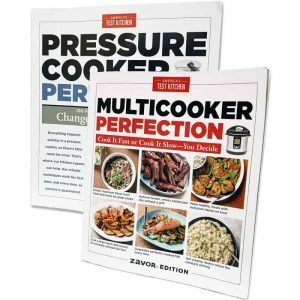 The Pressure Cook function not only reduces cooking time up to 70% but it also retains food’s natural vitamins and nutrients. It has High and Low pressure settings and a maximum cooking time of 6 hours. The Slow Cook function is perfect for foods that require long cooking times such as soups, stews and tough cuts of meat. 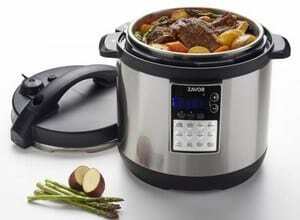 With High and Low temperature settings, the slow cooking function can cook for up to 24 hours. All the food specific functions, including those with dual settings such as BEANS/CHILI, come with their own preprogrammed cooking times as well as their own pressure cooking level or slow cooking temperature for optimal results. The Rice function comes pre-programmed with four different settings for White Rice, Brown Rice, Risotto and Steamed Rice. 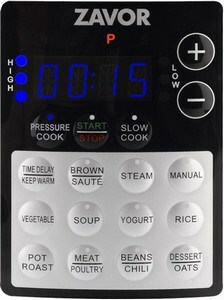 This function allows users to cook their rice to perfection in a matter of minutes as each setting comes programmed with their own cooking time. For users who prefer to cook rice as a traditional rice cooker, the Steamed Rice setting on this function will cook white rice as a traditional rice cooker would, using steam rather than pressure. The Steamed Rice setting does not come with a preset cooking time, the display will only show the outer lines cycling as the rice is steamed. The Manual fuction allow users to independently program the unit to function as a pressure cooker, slow cooker or standard stockpot. In addition to these cooking functions, the LUX Edge includes a Yogurt function that is programmed with a 2-step process that allows users to make yogurt right in the comfort of their own home. The Yogurt function includes guided prompts so users know which step in the process they are at. The display will read “HEAT” during the first heating step and then “YGRT” during the yogurt incubation step. One of the more unique functions on the LUX Edge is the Manual function. This function comes equipped with settings that allow users to independently program the unit to function as a pressure cooker, slow cooker or standard stockpot. As users press the Manual button, the screen will scroll through the settings by displaying “TEMP”, “PRES” and “SLOW” to indicate which setting is selected. The TEMP setting has a temperature range of 102°F-356°F. The 3 assist functions – Brown, Sauté, and Steam – help users complete all their cooking in one pot. The Brown and Sauté functions have adjustable temperatures ranging from 302°F-356°F for Brown and 266°F-300°F for Sauté. Once the Brown or Sauté buttons are pushed, users can use the + and – buttons to adjust the browning or sautéing temperature to their liking. The Steam function can steam all your foods to perfection with the assistance of the included stainless steel cooking rack. The Edge also includes a Mute feature with which users can silence all unit beeps by pressing and holding the + and – buttons simultaneously until the display reads “MUTE”. Users can reactivate the unit beeps by pressing and holding the + and – buttons simultaneously until the display reads “BEEP”. The LUX Edge is equipped with a self-locking lid, automatic pressure release setting and two independent pressure control valves. Included with the LUX Edge are a stainless steel cooking pot that is dishwasher safe, a user’s manual, a recipe booklet and a downloadable full color, digital recipe book with over 120 delicious recipes. The LUX Edge is available in 4Qt., 6Qt., and 8Qt. sizes.